Two teachers from Abington Friends School (AFS) traveled to La Paz in August 2005 to deliver a Spanish version of Quaker Education workshops designed in collaboration with Bolivian Friends. During follow-up workshops led by US Quaker teachers in 2007, local facilitators were trained and materials were translated into Spanish. Volunteers from the US and Bolivian leaders have presented workshops for teachers, administrators and school boards. Alicia Lucasi and Ruben Hilari presented workshops based on their experiences as interns at Carolina Friends School and Oakwood School. 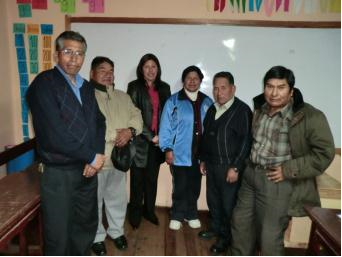 BQEF continues to work with Bolivian Quaker schools to improve their academic program and their witness as Friends. For several years, BQEF provided material and faculty training and staff support to help the schools develop English and computer programs as this was their highest priority. In 2013, Bernabe Yujra and Alicia Lucasi began working with The Friends School at Max Paredes on their strategic plan. Alicia presented a workshop on workshops on Quaker school models from the United States that she observed during her visits. She and Bernabe are continuing to meet with the school administration and staff. Funding for Quaker Education Workshops and other programs supporting Bolivian Quaker Schools is part of the staff budget for the Bolivian Quaker Education office in La Paz. Donations to the general BQEF fund support this program.